Our new friend Raine, an ex-pat from Atlanta, started a school for deaf children in Tororo called DEDO, Deaf Education and Development Organization. There are 14 kids in total, 12 boarding and 2 day students. 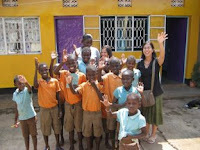 Most of the children had never been in school and there are few resources for them in this rural area. The kids are well-behaved and shy at first. They giggle and sign to us that they wish to get a pair of shoes and a bicycle. 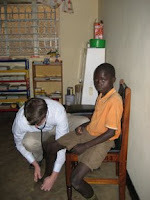 One boy named Robert who smiles a lot has a chronic cough. Phil examined him and thinks that he has a serious heart condition. He is 12, but small for his age and will likely require an operation to save his life. He needs an echocardiogram and the closest hospital that can do this procedure is four hours away. To get heart surgery, he would need to fly to India or South Africa. We are going to sponsor a boarding student and encourage you to take a look at this wonderful cause. Raine has paid most of the costs out of her own pocket and the monthly expenses add up between staff, food, rent, power, water, supplies, etc. It is truly a worthy cause and needs funding to continue to add students. See more photos of our visit to DEDO. We have thoroughly enjoyed your comments and photos of your journey through Uganda. You and Phil have opened our eyes to the great works that so many people are doing. They have truly found their life's calling, as you and Phil have. Can't wait to see you and the rest of your pictures.